I was just about to start writing own viewer for StarDict dictionaries for Harmattan, when I noticed that somebody already took the effort and the application is available. It's called DictionaryStar and it's developed on gitorious. With the hard part done, I've adjusted packaging of various dictionaries I've made available for StarDict so that it works fine on Harmattan. For now only English-Czech one is completed, you hopefully be able to get it soon at Nokia store. The reason I've started with only one is that this pretty much does not fit into content guidelines for Nokia store and I expect problems when this will be passing their QA. So I've decided to push only one for now and once I get it through, adding others will be easy. Published on Jan. 26, 2012, 4:30 p.m.
After fighting with i18n in QML, I've released GePeS 0.3.0. The only major change is that it now can be properly translated, for the first release Czech and Spanish translations were completed, however you are welcome to contribute translations! As usual, new version was submitted to Nokia store, hopefully it will pass QA review before Christmas. You can get sources from GePeS homepage or from Git. Published on Dec. 22, 2011, 11:22 a.m.
After some fight with qmake and lrelease/lupdate, I've finally managed to allow translations in GePeS. I see no clear reason why QML translating is that poorly supported within Qt tools, however with some hacks it seems to be doable. As usual with my software, besides using sources (Qt's translation files in this case), you can use translation server to do online translation. As there are only few words to translate, I hope some languages will be translated soon. Of course to give you good example, I've completed Czech translation immediately :-). Published on Dec. 14, 2011, 9 a.m.
Today, I've released GePeS 0.2.0. The only major difference is that it should reduce power consumption of your phone while it is running. Reducing CPU usage when application is not active was definitely on my roadmap, though email from "Publisher Support Specialist for Nokia" about this actually pushed me to investigate the issue. It turned out to be quite easy to disable sensors while application is not active and it did the trick. While doing this I also moved to using AlignedTimer to synchronize wakeups with other possible wakeups in the device. 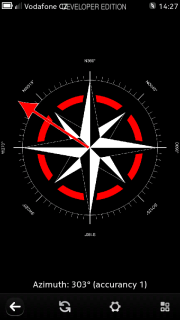 As usual, the application sources can be downloaded on GePeS page, binary will be soon available in Nokia store. Published on Dec. 8, 2011, 11:02 a.m. Yesterday, I finally took closer look at long standing GePeS bug on displaying speed and altitude wrongly (which I've mentioned in very first posts). For some reason I believed it is not my bug, but in QML bindings and let it be there. Receiving complain from Maarten ter Huurne, that this does not work made me look into it more deeply. Of course I found out it was caused by stupid typo and quickly fixed it. 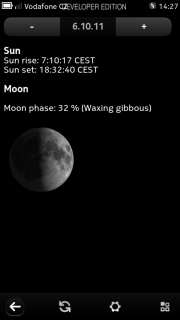 New release is now available on GePeS homepage and will be available shortly in Nokia store. Recently my installation of Qt SDK I use for development of applications for Nokia N950 (N9) got broken. It happened by update some postinst script failed what caused almost no part of Harmattan SDK to be installed. I hoped this to be temporary error which will get fixed by later updates, but it turned out to persist even for 1.1.4 which has been released week ago. Yesterday I finally got time to look into it and after some debugging I found out that it was trying to install x86_64 version, which was not downloaded because I was using 32bit installer. I quickly realized this was caused by using 64-bit kernel, while running 32-bit userspace, for which the installer somehow was not prepared. What will run the binary in 32-bit personality and make kernel pretend it is compiled for 32-bit. Published on Nov. 15, 2011, 8:08 a.m.
After finalizing DOF Calc 0.1.0 yesterday, I've decided to push new version of GePeS as well. 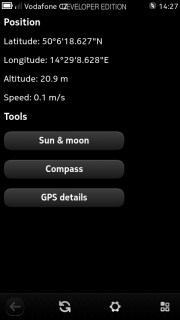 The update utilizes new Meego loader, so application should start much faster, add azimuth calculation for sun (set, rise and current) as well as compass is utilized for showing this azimuth. You can check all new features on screenshots page. 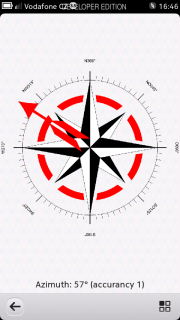 New version is currently available in git and tarballs, binary version will be in Nokia store as soon it passes QA tests there. Published on Oct. 27, 2011, 11:11 a.m. I've been doing some updates to DOF Calc in last days and today I decided it's time to push new it to public. The application has been switched to dark theme (which seems to be preferred one) and got working settings module. This means you can now configure list of cameras, lenses and apertures it offers, so that only choices you really use will be show. Besides that, application got new homepage with screenshots (what is true for GePeS as well). Published on Oct. 26, 2011, 1:35 p.m. Continuing on my Hackweek project, I've polished GePeS a bit today. 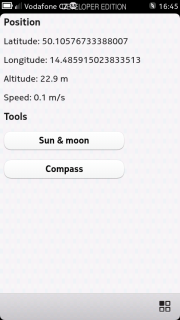 I started with better display of GPS coordinates and added some more GPS details to separate page. 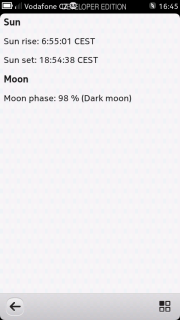 Adding images for moon phase was also part of the plan, though it force me to learn how to switch application to black theme, which looks much better with moon image. Rest of time was spent on cleaning up the code and adding preferences (for now only refresh rate). 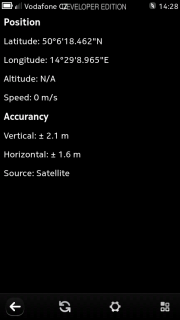 PS: Some numbers look weird (altitude and speed), though I'm pretty sure this is what phone reports me. Published on Sept. 27, 2011, 2:58 p.m. Published on Sept. 26, 2011, 4:49 p.m.